A new variable type, the Part-Search Variable (PSV), is being used to track and manage the information associated with the Part Search. The PSV permits access to the information within a Part-Search Grid from within CFL. It also provides the mechanism for the persistent storage of settings, and for CFL manipulation of the values. The Part-Search Variable (PSV) is a central object that encapsulates the part-search functionality. It derives from a variable, but consists of additional properties and sub-objects that perform the search functioning. In the product setup, a unique PSV must be added for each type of search that is to be performed. A single product may have several PSVs, each providing filtering and search on different criteria (e.g, one for shirts, one for hats, one for hoodies, etc.). The Smart Part Grid, Smart Part Search, and Smart Part Summary pull their underlying data from the PSV. Unlike other variables, the PSV data is not saved. It is reloaded and recomputed any time the order or estimate is edited, cloned, or converted. Watermark - controls the light grey text that appears in inputs when there is no value. Also known as Placeholder text. The Part Search Grid is an intelligent grid for displaying a subset of the parts in the system on a pricing form and allowing the user to quickly select the parts and add them to the order. 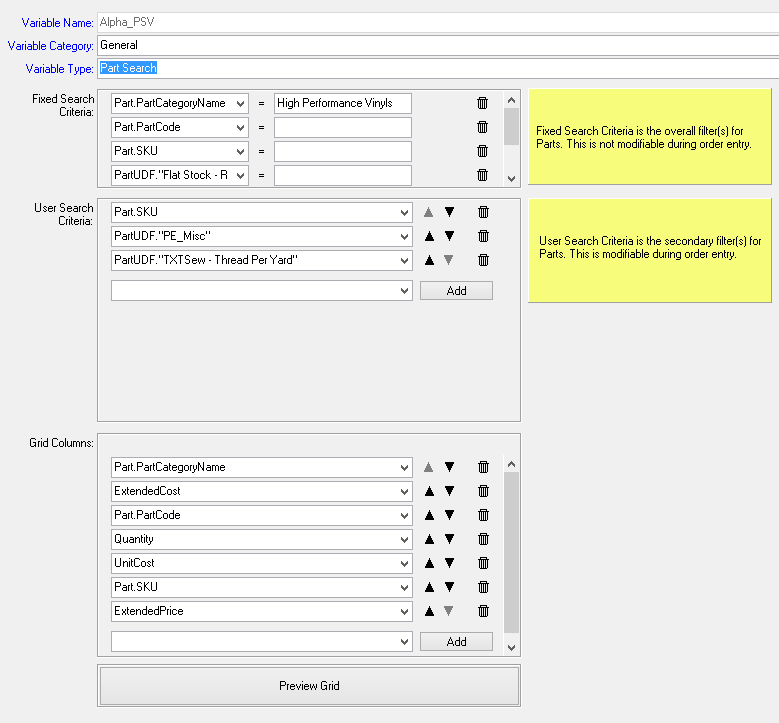 Each PSGrid relies on two search criteria to filter the parts that are displayed. The fixed search criteria is the overall filter for what parts are accessible from the grid. This is [normally] fixed for a particular grid on the pricing form. It limits the total choices possible for a grid, such as only T-Shirts, only hats, only a certain type of printers, etc. The user search criteria are user-input filters that limit the search results to the particular parts that the user is currently searching for. This is used to speed up order entry so the user does not have to scan all possible parts that match the primary search criteria. Typical examples might be based on SKU, Color, Style, or other searchable UDF fields. Inventory Properties (QuantityOnHand, QuantityAvailable, etc.) for the estimating warehouse. Unit Cost and Extended Cost of the part. Add To Order button allows the user to create multiple part types with differing quantities on the order with one click.